welcome to my brain . net: Green smoothie swirls. Here is how I make my fun, multi-colored green smoothies. These are more "special occasion" concoctions because they take a tiny bit more time. My kids' favorite base for smoothies is always Very Vanilla Soy Milk. I do not always use this, but it makes an appearance for special times. I start by pouring about an inch into the bottom of the glass. In my blender, I put in a can of pineapple (I try to have it already chilled in the fridge), two large handfuls of baby spinach and a little bit of water or soy milk. I let it stay thick. Then pour an inch or two of this into the glass, usually right down the middle, dividing it between all glasses. Then, I start over in the blender. Usually this time around I do another handful of spinach with some frozen berries and more water or soy milk. When I pour THIS batch into the glasses, I try to keep it over to one side (so you can see the color through the glass - otherwise it's not NEARLY as festive). And that's that! 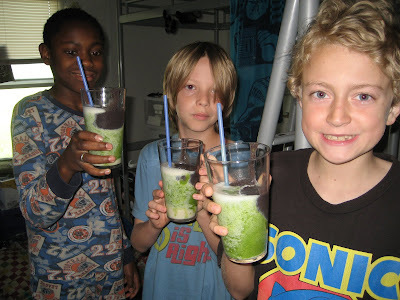 Swirly green smoothies. Packs a health filled punch and it makes you smile. I was wondering if that was the basic idea at play here - wonder if w/ the Barnie addition (any purple smoothies are still called Barnie smoothies over here from way back when my 16yr old loved Barnie) Eli might be tempted to give a green smoothie a try! You are a very good girl indeed. Thank you for clearing up the ???? You know this crunchy stuff is ironically unnatural for me. Shan, I like your squishiness. I like Shannon's squishiness, too. the milk base in the cup is brilliant. def going to try that next time. 1) I am so making this tomorrow. 2) I'm so freaking jealous that Organic Sister is there. Tell her I'm living by her dread washing blog posts for my hair. Kids + Green Smoothies = AWESOME! Sounds yummy to me! I love green smoothies, but this sounds like fun!